When The Springbank Distillery began double-distilling the highly peated (approx 50-55ppm) Longrow malt in the early 1970s, the goal was to demonstrate that one doesn't need to be located in Islay in order to make an Islay-style malt. Forty years later, the Longrow malt is still going strong. The quality of the product proves its success. I'm biased though (I've raved about Longrow here, here, and here) as I'm a sincere Longrow nut. Firstly, we have the dregs of my bottle of Longrow CV. Yes, look at that delicious sediment at the bottom of this unfiltered whisky. I included Longrow CV as the point of reference. As I've gotten pretty familiar with the CV, it was present as something to compare the others to. 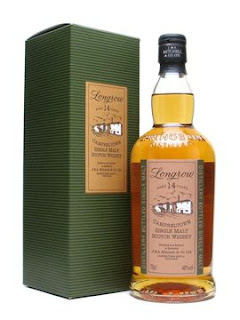 Secondly, we have Longrow 14 year old Sherry Finish, courtesy of a Master of Malt dram. I feel lukewarm at best about sherry finishes, but I'm always willing to keep an open mind. I went with those two first, as they were lightweights of the tasting. You know you have a good taste off when the lightest whisky weighs in at 46% ABV. Thirdly, the Longrow 10 year 100 proof (that's UK proof, so it's 57.1% ABV), via Master of Malt. Fourthly, the wild card: Longrow 14yr Burgundy Wood. This was among my first samples ordered from Whiskysamples.eu. 1.) I was most excited about the 10yr 100proof. I not only expected it to be the best, but I was willing to buy a bottle of it blind from Europe. But I remained patient. 2.) I had mixed feelings about the Burgundy Wood, expecting the wine to smother the Longrow spirit. In this post, I will cover the CV and the 14yr Sherry Finish. In the next post, I'll report on the 10yr 100proof and the 14yr Burgundy Wood, along with some final thoughts. Random trivia: You'll often read that this Islay-style malt was named Longrow after one of the many fallen Campbeltown distilleries. But, curiously, in "Whisky Distilleries of the United Kingdom", Alfred Barnard reports on a Longrow Distillery within Campbeltown AND a Campbeltown Distillery in the Longrow center of the Campbeltown township. Thus a Longrow Distillery in Campbeltown and a Campbeltown Distillery in Longrow. Both were among the smallest of the Campbeltown distilleries, with Campbeltown Distillery (60,000 gallons) having a higher output than Longrow Distillery (40,000 gallons). The notes here are brief as I'd intended this one only as a point of reference, so I poured a very small sample. Nonetheless, what started out as love at first nose, 15 months ago, has never abated. Sadly my CV lass has been replaced by a "Longrow Peated" bottling within the official range. While I will not denounce that new young whisky, I will miss the CV greatly. I hope to pick up one more bottle before it's gone. Availability - Rare in the US. Not prevalent, but still somewhat available in Europe. Palate -- Much softer than the CV, mossy peat, red LifeSavers, brown sugar, cayenne pepper, a floral perfumy note develops after some time. The sherry notes did not intrude, rather they snuck in around the corners. The former sherry casks, as well the additional time in the ex-bourbon barrels, greatly calmed the peat. There's another version of the 14 year old in circulation (not sure how the labels differ) that's a vatting of sherry and bourbon cask matured malt, which is what I'd tried at last year's Peatin' Meetin'. That one was more farmyardy and salty than this one and probably preferred by my palate. But for a sherry finished whisky, I was much impressed with this version from the Taste Off. Perhaps the keys are using a refill cask......and having stellar malt to start with. I think I find the CV a bit peatier than you do, but it is tasty stuff. I accidentally bought two bottles of the 14 YO (TWE and MoM list them differently, so I thought I was getting two different whiskies - whoops), so I'll have to do this comparison myself. I'm still wondering if there are two different 14 year olds. The one I tried at The Peatin' Meetin' last year was very Longrow-ish. More of a barn than the orchard of this MoM sample.